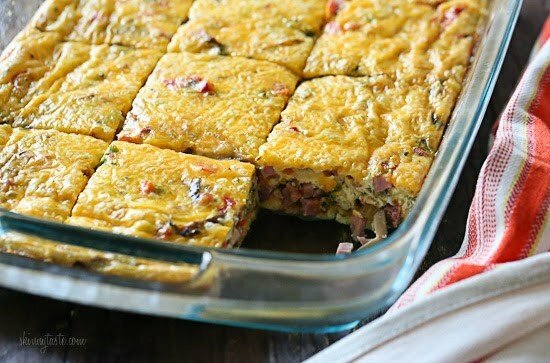 Make this easy breakfast Veggie Ham and Cheese Egg Bake for a large gathering or make it ahead for meal prep for the week. 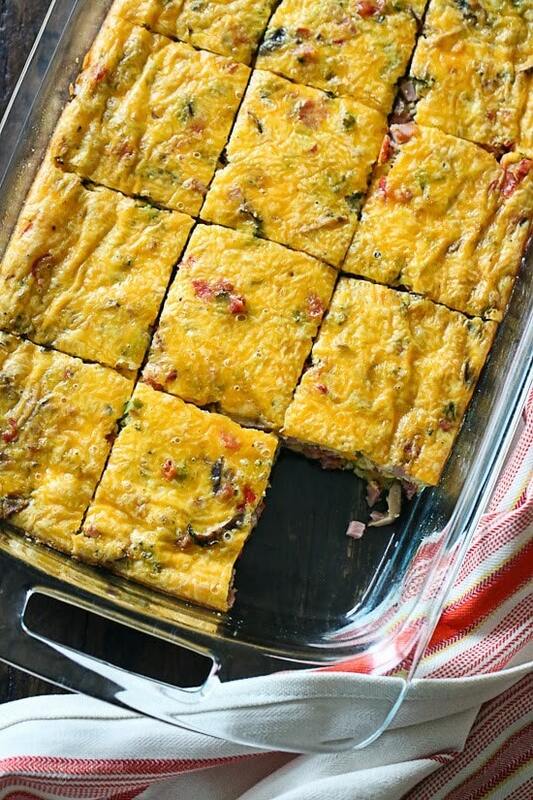 I love making breakfast casseroles when I am hosting brunch or bringing a breakfast dish to a potluck. Some other favorites are Sausage Cheese and Veggie Bake, Tex Mex Breakfast Casserole and this Spinach Feta and Artichoke Bake. My sister in law Denise made this at a brunch she hosted and I knew I wanted to remake it (just a bit lighter). Her recipe called for flour but I tested it without and it worked fine. I swapped some of the eggs for egg whites, added a lot more veggies and the results were wonderful! You can prep it ahead and bake when your guests arrive. You can swap the ham for sausage or leave it out to make it vegetarian.Refrigerate for up to 4 to 5 days.To freeze, cut in portions and wrap tight with plastic, transfer to freezer safe containers or ziplock bags. To thaw, place one in the refrigerator the night before. Preheat the oven to 375°F. 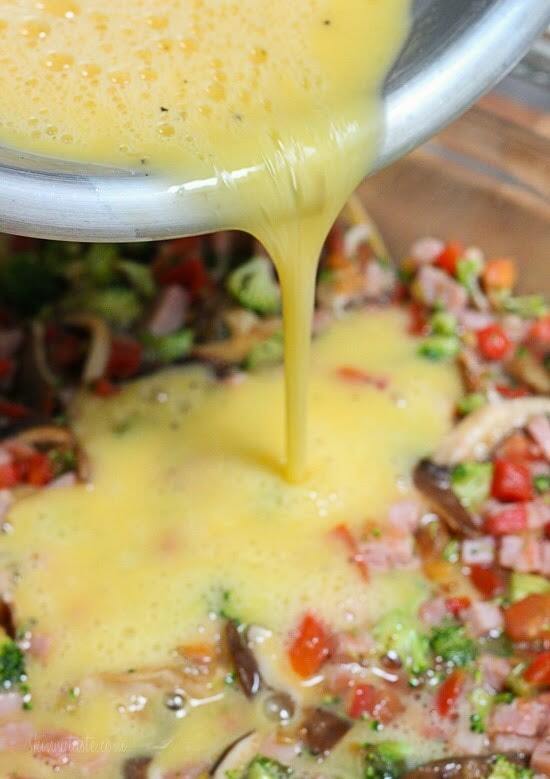 Spray a 9 x 13 baking dish with oil.Place 1 cup of cheese into the baking dish.Heat the oil in a large nonstick skillet over medium heat; add scallions, mushrooms and red pepper and sauté until vegetables are tender, about 5 to 6 minutes. Add the tomatoes and cook 2 – 3 minutes. Add the ham and broccoli and remove from heat. 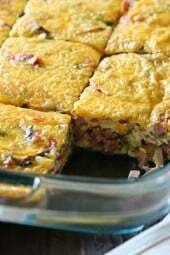 Spread evenly over the cheese mixture.In a large bowl combine the eggs, egg whites, milk, salt and pepper and whisk well. 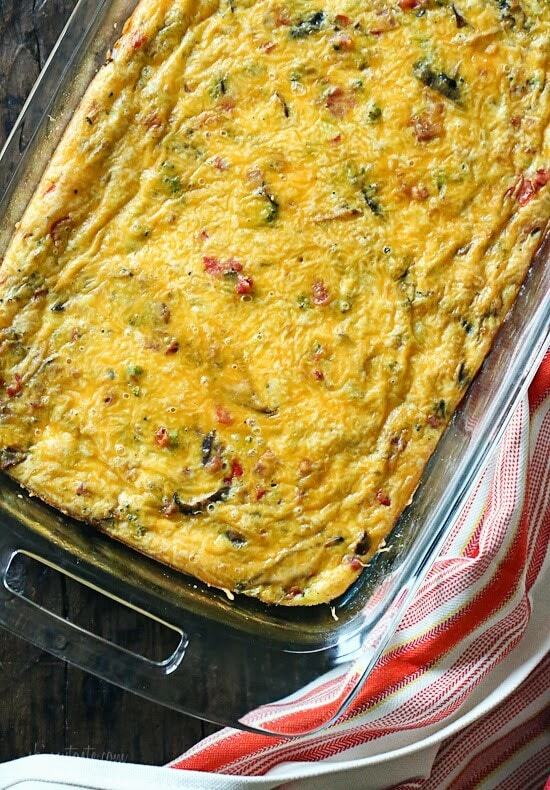 Slowly pour over the vegetables in the baking dish and top with remaining cheese.Bake until a knife inserted near the center comes out clean, 32 to 35 minutes. Let stand 8 to 10 minutes before cutting into 12 pieces.